A strong tradition of short-term health missions (STHMs) exists around the world. STHMs have positive and negative effects on local health systems, and these consequences are often unanticipated and unintended. 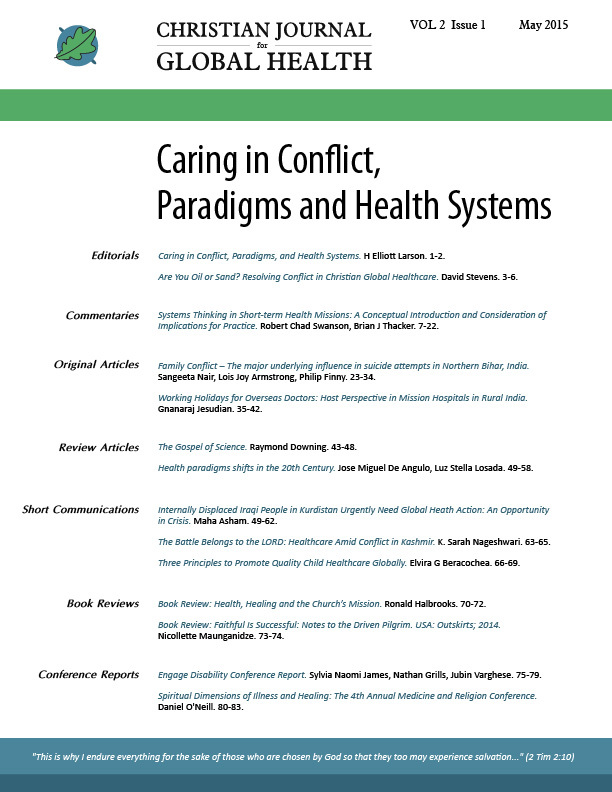 Conceptualizing local health systems as complex adaptive systems (CASs) may help global health actors approach global health activities, including health missions with a greater appreciation for local cultural and environmental context, leading to increased local capacity and impact while minimizing unintended negative consequences. For some, this might entail a shift in practice as it relates to short-term humanitarian work. In this paper, we introduce readers to health as a complex adaptive system (CAS). We then consider implications for practice, including adopting a “learning health system approach,” that engages local stakeholders in an ongoing, iterative process of mutual learning and self-organization. McLennan S. Medical voluntourism in Honduras: ‘Helping’ the poor? Prog Dev Stud. 2014 Apr;14(2):163-79. Chuckwuma A.: From silos to systems: Dealing with population health challenges in the world today. Consultancy Africa Intelligence, 2013. Dupuis, CC. Humanitarian Missions in the Third World: A Polite Dissent. Plast Reconstr Surg. 2004 Jan;113(1):433-5. Roberts M. A piece of my mind. Duffle bag medicine. JAMA. 2006 Apr;295(13):1491-2. Richard F, Hercot D, Ouédraogo C, Delvaux T, Samaké S, van Olmen J, Conombo G, Hammonds R, Vandemoortele J. Sub-Saharan Africa and the health MDGs: the need to move beyond the “quick-impact” model. Reprod Health Matters. 2011 Nov;19(38):42-55. Hardwick KS. Volunteering for the long-term good. Compend Contin Educ Dent. 2009 Apr;30(3):126,128. Plsek P, Greenhalgh T. Complexity science. The challenge of complexity in health care. BMJ. 2001 Sep;323:625-8. Williams B, Midgley G, Hummelbrunner R, La Goy A, Imam I, Reynolds M, Eoyang G. Capacity.org. A gateway for capacity development. [Internet]. The Hague: Capacity.org; Thinking Systemically; 2010 Oct 29. [cited 2014 May 30]. Available from http://www.capacity.org/capacity/opencms/en/topics/context_systems-thinking/thinking-systemically.html. Committee on Quality of Health Care in America, Institute of Medicine. Crossing the Quality Chasm. A New Health System for the 21st Century. Plsek PE, contributor. Washington: National Academy Press; 2001. Appendix B, Redesigning Health Care with Insights from the Science of Complex Adaptive Systems; p. 309-17. Paina L, Peters DH. Understanding pathways for scaling up health services through the lens of complex adaptive systems. Health Pol Plan. 2012 Aug;27(5):365-73. Woodhill J. Capacities for Institutional Innovation: A Complexity Perspective. Inst Dev Stud Bull. 2010;41(3):47-59. Richardson KA. Systems theory and complexity: Part 3. E:CO. 2005;7(2):104-14. Travis P, Bennett S, Haines A, Pang T, Bhutta Z, Hyder AA, Pielemeier NR, Mills A, Evans T. Overcoming health-systems constraints to achieve the Millennium Development Goals. Lancet. 2004 Sep;364(9437):900-6. Hawe P, Shiell A, Riley T. Theorising Interventions as Events in Systems. Am J Community Psychol. 2009 Jun;43(3-4):267-76. Wolfberg, AJ. Volunteering Overseas—Lessons from Surgical Brigades. N Engl J Med. 2006 Feb;354(5):443-5. Zink T. Reborn in Honduras. Family Medicine. 2005 Feb;37(2):94-5. Buchman S. Tariro: Finding hope in Zimbabwe. Can Fam Physician. 2007 Nov;53:1971-3. Fisher QA, Nichols D, Stewart FC, Finley GA, Magee WP Jr, Nelson K. Assessing Pediatric Anesthesia Practices for Volunteer Medical Services Abroad. Anesthesiology. 2001 Dec;95(6):1315-22. Wright IG, Walker IA, Yacoub MH. Specialist surgery in the developing world: luxury or necessity? Anaesthesia. 2007 Dec;62(s1):84-9. Wilson JW, Merry SP, Franz WB. Rules of Engagement: The Principles of Underserved Global Health Volunteerism. Am J Med. 2012 Jun;125(6):612-7. Montgomery T. Short-Term Medical Missions: Enhancing or Eroding Health? Missiology: An International Review. 1993 Jul;21(3):333-41. Dickson M, Dickson G. Volunteering: Beyond an Act of Charity. J Can Dent Assoc. 2005 Dec;71(11):865-9. Snowden D. Cynefin framework [Internet]. Wikimedia Commons; 2011 Feb [cited 2014 May 28]. Available from: http://commons.wikimedia.org/wiki/File:Cynefin_framework_Feb_2011.jpeg. Land T, Hauck V, Baser H. Capacity development: between planned interventions and emergent processes. Implications for development cooperation. Capacity Change and Performance. 2009;1-8. Adam T. Advancing the application of systems thinking in health. Hlth Res Pol Syst. 2014 Jun 16. Balabanova D, McKee M and Mills A (eds). ‘Good Health at Low Cost’ 25 Years On: What makes a successful health system? London: London School of Hygiene & Tropical Medicine; 2011. 399 p.